The so-called servaline cat has very fine or almost indistinct spots, and is said to be smaller than the larger spotted forms. In general, the spots are more bold in the drier parts of the serval’s range. Melanistic or all-black forms have been reported to live in some mountainous areas. The tail of the serval is short, down to the hocks. It is tipped with black, is spotted, and ringed in the distal half. 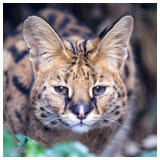 A serval’s ears are black with central white bars. Their skulls are distinctly elongate and the upper anterior premolars are present. Wozencraft (1993) in the latest review of cat taxonomy has placed the serval (usually considered to be in the genus Felis) in the genus Leptailurus.